2. Open the file called construct#7 in the Tutorial Files folder by choosing File > Open… . 3. It should be displayed in graphic view, but if not select Construct > Display > Display Graphics . 4. 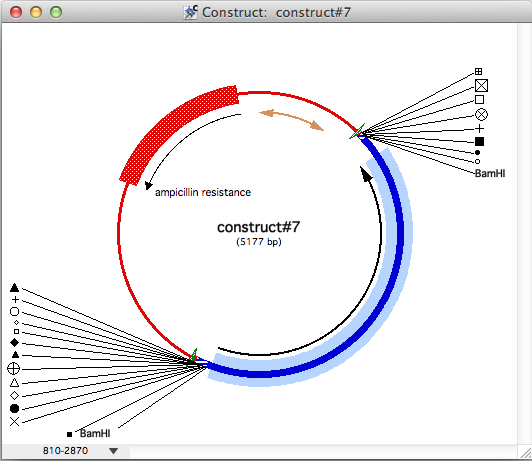 Select the segment of DNA (red circle) that represents the ampicillin resistance gene by double-clicking on the black arrow seen between 10 o’clock and 11:45 on the circular construct. 5. Now select Format > Lines > Pick a Width… and enter the value 19 (represents the pixel width of the DNA segment). See Figure 2.96. 6. Next choose Format > Fill and select the third item in the top row of the fill pattern sub-menu (a white dotted fill). 7. Next select Format > Style > Copy Style to add this segment formatting to the clipboard. 8. To apply this style, select a portion of the blue colored segment by double-clicking on the black arrow seen between 2 o’clock and 6:30 on the circular construct. See Figure 2.97. 9. Finally, select Format > Style > Paste Style to apply the formatting copied from the ampicillin resistance segment. The formatting of the portion of the selected blue segment should have been updated to match the red, 19 pixel width, dotted fill pattern created on the ampicillin segment in steps 4 through 6, and your construct should appear as in Figure 2.98. Styles can be copied and pasted between similar features, in both the graphic and sequence views, and between multiple open GCK constructs. In addition to the line formats (colors, thickness, fill patterns, etc.) we worked with in this tutorial, the font styles (font color, font size, font style) are also stored with the segment, and the styles can be copied and pasted. Try switching to sequence display to see how font styles can be applied. Copy and Paste Styles gives users a way to create customized formatting they recognize for specific regions, then quickly apply that same formatting to other similar features of their construct. This concludes the tutorial. Close construct#7 file, but do not save any changes you may have made so that others may work with this sample file in the future. This entry was posted in gene construction kit tutorials and tagged Apply Graphic Formatting, Copy Style, Gene Construction Kit Tutorials, Paste Style. Bookmark the permalink. Trackbacks are closed, but you can post a comment.